Rolle's theorem is one of the foundational theorems in differential calculus. It is a special case of, and in fact is equivalent to, the mean value theorem, which in turn is an essential ingredient in the proof of the fundamental theorem of calculus. In the figure above, we can set any two points as \(\big(a,f(a)\big)\) and \(\big(b,f(b)\big)\) as long as \(f(a)=f(b)\) and the function is differentiable within the interval \((a,b).\) Then, of course, there has to be a point in between where \(f'=0,\) which is the red point in the diagram. Now let's take a look at the mathematical proof of this theorem. (1) \(f(x)\) is a constant function. \[\] (2) \(f(x)\) is not a constant function. 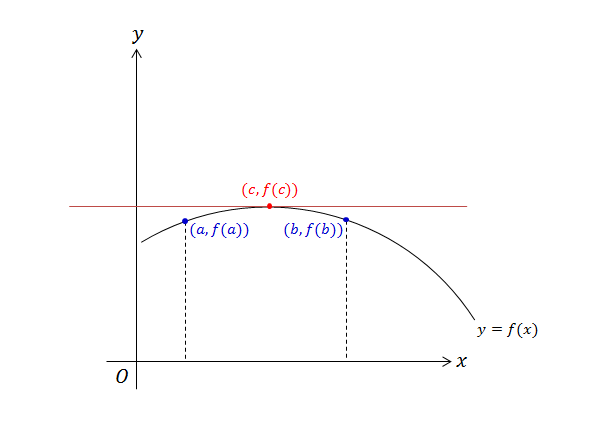 show that \( f'(x)=0\) has at least one root in the interval \( 0< x < 2 \) using Rolle's theorem. show that \( f'(x)=0\) has at least one root in the interval \( -\pi< x < \pi \) using Rolle's theorem.